On Saturday, January 16, 2010 the Minnesota Horse Council announced their selection for the 2009 MN Horse Council’s Horse Person of the Year at their annual meeting in Brooklyn Park, MN. It is seldom that a winner happens to be someone that no one on our committee personally knows. Such was the occasion this year. Not one of us knew the recipient prior to this evening, however, we all agreed, based on the nomination letters that came in that the candidate was as well qualified as they come. The recipient’s lifelong dedication and contributions to the equine industry, horses and horse owners make the recipient a model for all of us to emulate, and uniquely worthy of this esteemed honor. It is a fortunate life that has been touched by a person with the integrity and compassion of the recipient. The experience, knowledge and way with horses make this years’ recipient an extraordinary horseman but the fact is, this years’ recipient is also every bit as good of a human being as he is a horse person. While it is without question that throughout the years, the recipient has developed extraordinary insights into horses, someone once said ”As good as the recipient is with horses, he is even better with people.” He is a horseman in the truest sense of the word and his willingness to help anyone at their level, with unending patience and positive encouragement is perhaps his greatest gift. As have been most of our recipients in the past, this years’ recipient was born the child of a horseman and has been involved with horses most of his life. As a young child, he and his brother trained and showed a trick horse throughout central Minnesota. By the age of 12, be had began training horses, and by the age of 15 he was teaching others how to ride. His wealth of knowledge came from spending time with other trainers and studying everything there was to study about horses. For over 60 years, our recipient has been giving back to the equine industry at the most basic level, by helping to create better horses and in fact, creating better people. The recipient treats his students with patience, kindness, and understanding, whether they have two legs or four. He shows his students how to do things correctly instead of forcing them into learning new concepts, once again applying to both his two legged and four legged students. Although he has many ribbons, trophies and awards that can be looked up to, his biggest trophy of all is the overwhelming number of people and horses he has treated in such a compassionate way. One letter came in from a County Probation officer, who the recipient had worked with back in the 1980’s. The recipient taught his person lessons not only about horses, but also about life and the integrity of what it means to have and take care of animals. Good, Better, Best. Never let it rest until the good is better, and the better is best. This is a saying that many have heard our recipient use over the years. He has been inducted into the Minnesota Quarter Horse Hall of Fame, and recently awarded honorary membership in the FFA chapter for his many years of service to the organization. He serves as a mentor for local youth within the FFA program and has even provided employment and learning opportunities in horse judging. He was one of the founding members of the Rum River Saddle club and the Rum River Horseback Square Dance Team. The Square Dance team competed at the MN State Fair winning the competition 3 years in a row. As he approaches his 79th birthday, this years’ recipient can still be found showing a yearling in lunge line classes at the local shows. He has offered horsemanship clinics for 29 years in Proctor, MN for youth and adults. As a strong supporter of the local 4-H program, he makes sure to get all the questions answered and make each child feel special by building their confidence so they sit taller and ride with a good feeling about themselves. 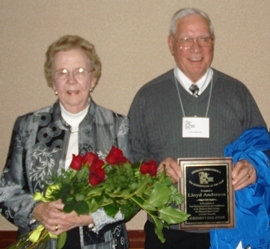 Congratulations to the MN Horse Council’s 2009 Horse person of the Year – Mr. Lloyd Anderson of Milaca, MN.